Potential clients often come to me explaining that their doctor, physical therapist or chiropractor has suggested that they “strengthen their core” in order to alleviate pain or weakness in many areas. I also have students who on their own have decided that they desire training in this area. So what exactly are we talking about? “The Core” is a term frequently used, but seldom fully understood. The core originates most full-body functional movement and also determines to a large part a person’s posture. The human body is built to take force upon the bones and move through various joints in a desired direction. The core muscles align the spine, rib cage, and pelvis of a person to resist a specific force, whether static or dynamic. Core exercises such as those practiced in Pilates train the muscles in the pelvis, lower back, hips and abdomen to work in harmony. This leads to better balance and stability, whether performing recreational or daily activities. Functional Movements are highly dependent on this part of the body, and lack of core muscular development can result in a predisposition to injury. In fact, most sports and other physical activities depend on stable core muscles. Where exactly are these muscles located, and which muscles are we talking about? The major muscles of the core reside in the area of the belly, hips and mid and lower back. Major muscles include the pelvic floor muscles, transversus abdominis, diaphragm, internal and external obliques, rectus abdominis, quadratus lumborum, multifidus and erector spinae (sacrospinalis) especially the longissimus thoracis. 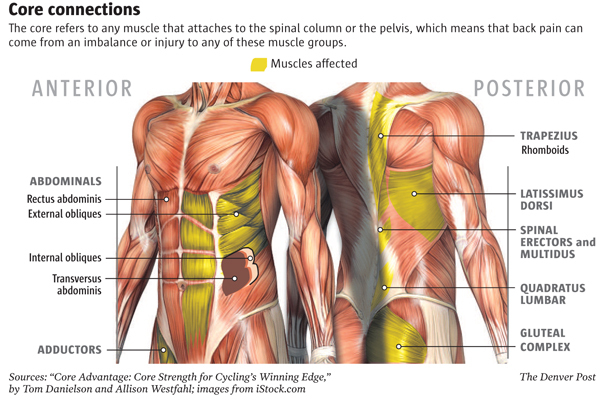 Minor core muscles include the latissimus dorsi, gluteus maximus, and trapezius.